Wow, we’re getting there!! You have a mere two days left to get your contest entry in and have the chance to win some beautiful handspun from Jess, some Cherry Tree Hill, Spunky Eclectic or Fleece artist. Now, I know you don’t want to pass that up, right? $5, $10, $20, $50….whatever you can give, every dollar is helpful to those wonderful farmers. Help keep a small farmer in business and win some yarn. See sidebar for details. You’ve got until midnight Saturday (central time) to get in on the goods. Now go and sow those seeds!! I should get a job for public radio. Knitting, you’re here for knitting, right?? Okay, I’ve got knitting. You may all collectively “oooohhhh” at them right now. Yeah, I know. I didn’t block them yet. The stitch pattern is a bit lost in the yarn, but I still love them. They are the most comfortable and best fitting socks I’ve knit. The toe is incredible and I might knit them like this always: circular decreases, no kitchener stitch, lots more room for my toes to wiggle around in. But I forgot to take a close up. Bummer. 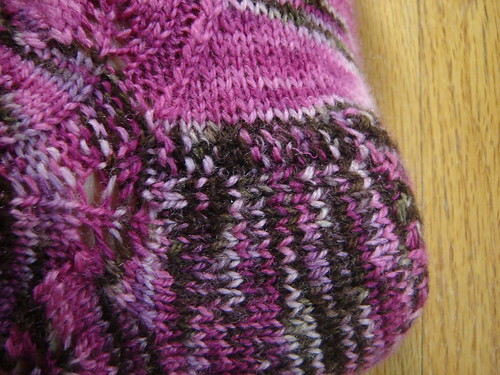 I dig the garter stitch edging on the heel. I did use reinforcement thread to protect this precious yarn. Yarn: Louts Toes in the Chocolat Cheries colorway, by Zen String. I notice she has a sale right now…..
Pattern: Embossed Leaves from Favorite Socks. Comments: Easy lace pattern. I highly recommend this one!! Have a great weekend everyone. Remember, the coffeeswap opens up Monday. I’ll post a link to the new blog on Sunday.